The space “Green Globe”, made by “Sky Festival” and “Earth Flower” has themes of “the heavens and the ground” and reflect oriental nature. I submit “Green Globe” as Beijing’s new landmark that is respects mother nature afresh.”Sky Festival” stands to the sky is the 29th Olympic’s monument.When people travel north from the National Stadium they will be find the symbol of the Olympic green, this monument appears to the east side of City’s Central Axis, opposite the Convention Center. The tower sculpture represents the minds of athlete’s efforts to improve themselves and also symbolizes the accumulation of the Olympic Game’s history. “Sky Festival” is intended to be seen from various places. From the bridge on the waterside, from the promenade of the opposite bank and from all floors of architecture around the monument. This monument stands on center of the Central Area. There is the Forest Park here with beautiful green and water, 1km north from “Sky Festival”. There is magnificent green as far as the eye can see during the daytime. Laser light is shot into the dark sky along the City’s Central Axis in the evening. The sculpture made of stone, “Earth Flower”, expresses the circulation of nature and is located in the east of the open lawn space near the park entrance, on the bank’s of a pond. This monument’s form seems to softly stroke the earth. 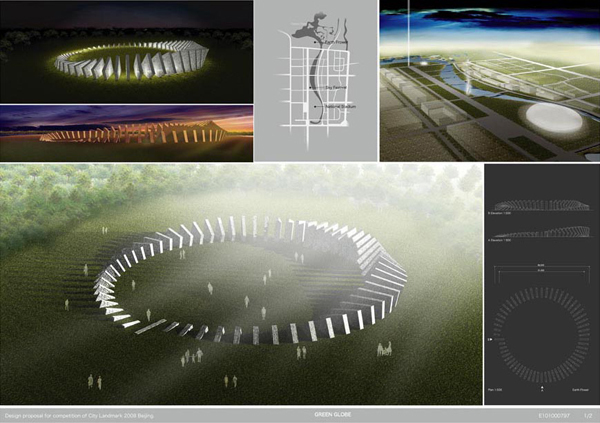 A circle around the movement allows people to gather around the monument creating harmony between humans and the green in the Forest Park new paragraph. Our design proposal is a symbol of the mind of the Beijing Olympic and a place providing visitors with the to think and feel about mother nature. A plant never stops growing and constantly grows taller and stronger at the same time so that it can always support itself. This durability helps the plant to make its own space above the ground moving towards the sky against gravity. “Sky Festival” means this plant’s growing process. The monument stands as if it were tree growing up to Beijing’s sky, while at the same time being firmly connected into the ground. “Sky Festival” seems to carry the life energy of the earth up to the heavens while the energy of the sun permeates into the ground through this monument. When seen from a distance, the monument’s form changes on the viewpoint, sometimes appearing as the form of a woman. Olympic symbol is engraved on the frosted glass. 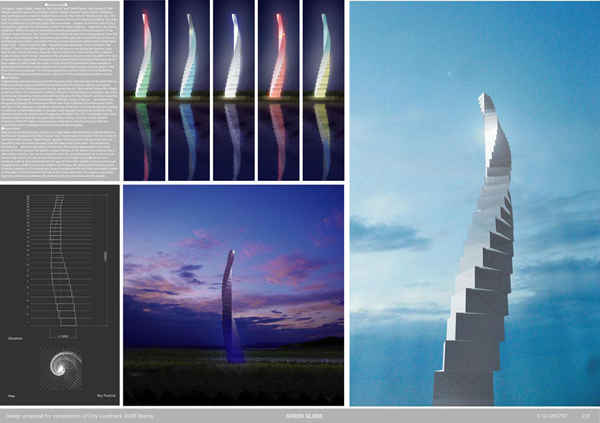 It changes many beautiful surfaces by sunshine in the daytime and also its surface color changes by LED lights. The LED’s 16,700,000 colors have splendid effect on Beijing’s sky, especially in the evening. Using the various flexible programs of the LED lights, I shall proposal a light show that presents each Olympic nation’s flag color changing every few hours and also everyday. Nature is an everlasting cycle. I propose an open space with landmark sculpture that has the themes “Symbiosis of all life if nature” and “A principle of circulation” in one corner of the Forest Park entrance. “Earth Flower” appears half above and half below the ground. Everything was born from the earth and will eventually to the earth. This everlasting circulation is powerful enough to hold human life and this represented using huge pieces of Chinese granite. The granite surface changes in the various atmospheres and is affected by sunshine. One section of granite of in the circulation path has a mirror finish surface that reflects the sky, ground and people on it. People may walk along stone sculpture, walk up and down between the gap of stone, lean against a stone, lay down on the grass and so on… It is not only children that will enjoy the area around this monument. Sunshine swaying on this monument, leaves trembling in the wind that also makes ripples on the water. There are brilliant feelings of time and space here that makes a marvelous harmony and balance between the environment, the monument and the people.